Motorola has launched Moto Z almost six months back in June 2016, which sports a 5.5 inch QHD display and is powered by Qualcomm Snapdragon 820 processor along with 4 GB of RAM. It runs on Android 6.0 Marshmallow based operating system and is backed by 2600 mAh battery. In terms of camera, it features a 13 MP main rear camera and a 5 MP front shooter. Today a new variant of Motorola Moto Z XT 1650 has popped on bench-marking portal Geekbench which suggest a new variant of the flagship device with the same model number, but powered by the upcoming Qualcomm Snapdragon 835 processor. 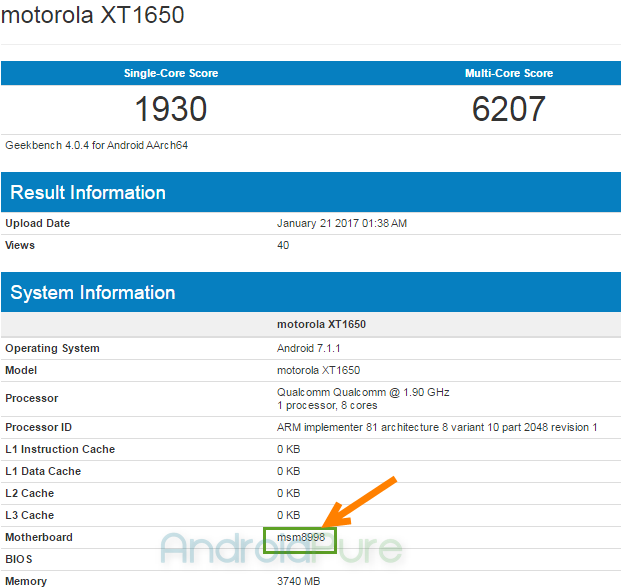 As per the Geekbench listing, it comes with a model number XT1650 and could be the Moto Z (2017) device. The listing indicates that Motorola XT1650 is powered by 1.9 GHz Octa Core Qualcomm MSM8998 SOC chip which is Snapdragon 835 processor. It comes with 4 GB of RAM and runs on Android 7.1.1 Nougat based operating system. Unfortunately, the Geekbench listing doesn’t reveal more details about the device. In spite of being the same model number listed, we assume it as the next Moto Z variant or Moto Z (2017). Yet, take this leak with a pinch of salt. At the moment we have no official information on any new flagship device from Motorola. Stay tuned at Androidpure and we will keep you updated.